Nordic Semiconductor has partnered with iBasis, one of world’s largest international cellular data carriers, to offer global connectivity for its nRF9160 cellular IoT module. 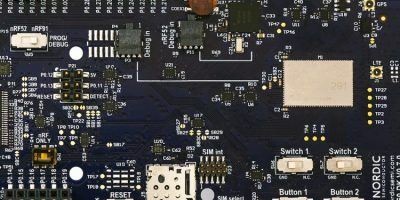 To achieve this, Nordic has bundled the eSIM with 10Mbyte of free initial data into its nRF9160 development kits. A Nordic nRF9160 cellular IoT customer has to do is register their eSIM on Nordic’s nRF Connect for Cloud website to seamlessly connect to the iBasis Global Access for Things network and gain access to a range of configurations, monitoring, and connectivity services. An eSIM is a remotely, over-the-air provisionable (programmable) SIM that can hold multiple sets of local network operator credentials, whereas a traditional SIM card can only hold one set of operator credentials. The iBasis eSIM meets all relevant GSM Association (GSMA) standards and is soldered onto the nRF9160 SiP module. Nordic Semiconductor explains that in reality, global smartphone connectivity and roaming services are provided by only a few international carriers that partner with local national carriers to enable connectivity and roaming for voice, data, and IoT services worldwide. iBasis is one of the largest international carriers or IP exchange providers; it is used by more than 700 local carriers in over 190 countries. nRF9160 cellular IoT customers get instant global connectivity without having to negotiate and manage multiple relationships with individual local cellular carriers around the world. Using eSIM technology, they are able to leverage iBasis as a single supplier, with a single contract, a single operations online dashboard and a single monthly bill that breaks down the global services that are used. The nRF9160 SiP is available from global distributors. The SiP is significantly smaller, lower power, and has more security features than any other cellular IoT module launched to date for LTE-M and NB-IoT applications, claims Nordic Semiconductor. It is also certified for global operation.